Jedda Daisy Culley is a total powerhouse. The artist, mother and force behind fashion label Desert Designs is gearing up for her latest solo show, Burns at the Land’s Brim, when we speak. 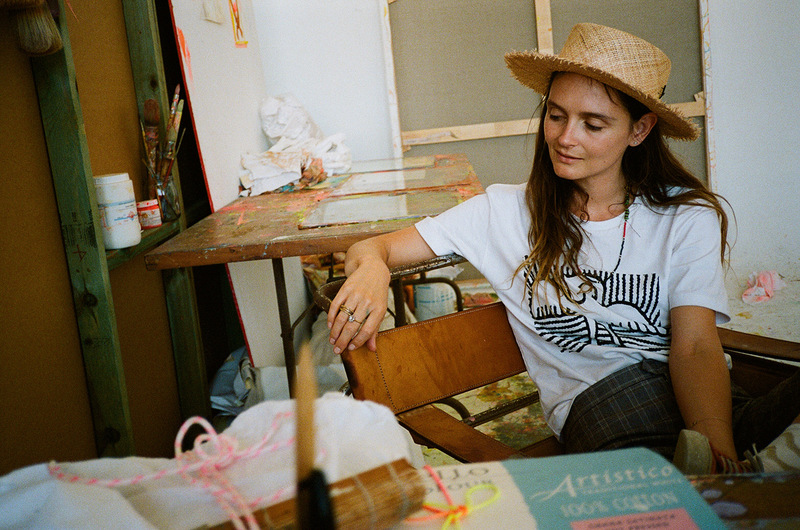 Ahead of the much-anticipated March 24th opening hosted by Mild Manners gallery in Surry Hills, On the Collar visited Jedda in her Surry Hills studio. 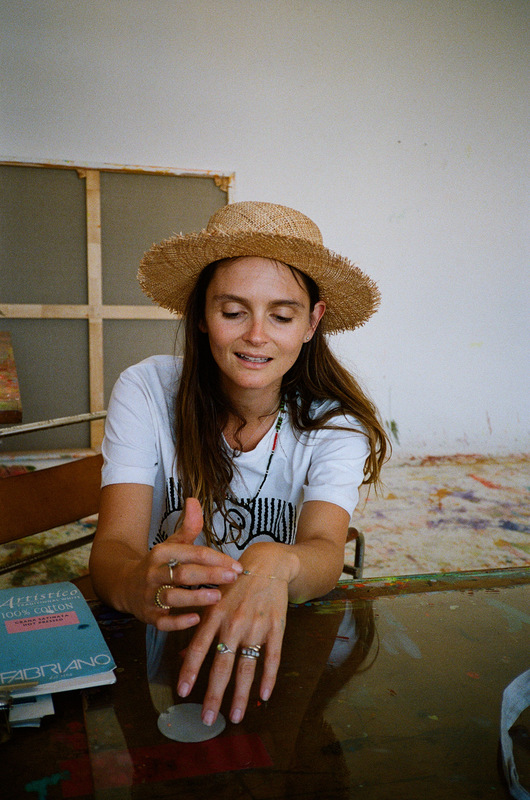 Hanging out with the ultra-chilled artist, we found out about the inspiration behind her upcoming show, as she shares memories from the desert and lets us in on the history behind some of her favourite accessories. ROSIE DALTON: Can you tell us a bit about your upcoming show, ‘Burns at the Land’s Brim’? JEDDA DAISY CULLEY: Well it is based on a trip, which we took from Sydney to Alice Springs and then further up into the Northern Territory and back again. We went with the kids, so it was pretty wild. We stopped along the way and looked at different landscapes, then mapped up this idea of a doing a show, where I would stop and do quick sketches of landscapes. Then I would later build them in the studio. ROSIE: Were there any particular moments of inspiration along the way? JEDDA: There was one really profound moment on the trip actually. We were sleeping in this Indigenous community called Marlinja – this is where the band Kardajala Kirridarra is from and we were staying with them. So I was sleeping in a two-man swag with Dan and both of our kids, when I woke up and saw the most incredible sky. On one side the sun was starting to come up and it was this intense, fluoro red colour. Then on the other side – directly opposite – the moon was starting to set and that side of the world was lilac. It was like equal points and the sky travelled in a gradient from bright red to lilac. It was as if I was sitting above the earth and I could see it as a dome. That moment really inspired the colours in the show. ROSIE: I am so intrigued by the colours out in the desert. JEDDA: Oh yeah, the colours are so different out there. My dad is a colourist and I’ve spent a lot of time with Jimmy Pike, who is also a colourist. It’s interesting, because when they met, Jimmy would always gravitate towards Texta pens, because they are luminous and vibrant. And those really are the colours of the desert. So that’s what I’ve been brought up to be sensitive to and it’s where my colour palette has developed. ROSIE: And you are wearing some colour today too! JEDDA: Yeah I am wearing red shoes – I always red shoes. ROSIE: Okay, so what are some of the messages underlying the works in your show? JEDDA: Well on the one hand, this show is a documentation of a trip, but on the other hand, it is about a more internal journey. We spent a lot of time at Katherine Gorge, for example, and there’s a cliff there called ‘Jedda’. So there is a painting in the show called ‘Jedda’. But then there are other aspects [behind the works], which I haven’t spoken about so much. Basically I was drawn to this idea of the Mother being the land and I think this has manifested itself in quite feminine, sexual landscapes. You will see this in landscapes that look like they’re erupting and in a merging of the plains. I am quite interested in that metaphysical blur – in exploring where things begin and end. ROSIE: You are wearing lots of beautiful rings. Do you normally keep these on when you paint? JEDDA: Oh yeah. My grandmother always wore a lot of rings, so I think that’s why I now wear a lot of rings. This stack belonged to my mother-in-law and then she passed them on to me. This ring was my grandmother’s and I remember it from when I was a child. It always gets covered in paint when I’m in the studio, but I feel like it’s more meaningful for me to have it on while I’m working. And then I wear this ring by Venice – she is very meaningful to me, because I have known her my whole life. ROSIE: What about your awesome wedding stack? JEDDA: Well Daniel gave me the interlocking dolphin ring when we first got together and realised we were having Lucien. This opal one is my engagement ring, which we bought in Coober Pedy. I gravitated to this one, because it reminded me of one of my grandmother’s rings. And then our wedding rings have a pretty interesting backstory. We got married sort of out of the blue, on an island in Greece. We were living there for a few months and found this tiny chapel in the middle of the sea, which we knew was the spot. But because we did it all so last minute, Daniel had to find a jewellery maker on the island to fashion these rings straight up. He put a little sun and a moon inside them. ROSIE: That’s so beautiful! I noticed that you’re wearing an opal earring too – is this one of your favourite stones? JEDDA: Oh yeah, this opal I bought in New York when we lived there. I used to have two, but then I lost one. I do love opals actually – I am just really into how magical they are. I bought this other earring in Greece and my mum has a matching one. Then I always wear my Venice necklace and this little face one is a new addition. I don’t know if he’ll last for a minute or forever. My beads came from LA and used to be a strand of three. Then my daughter ripped one, so we sewed it back together. Then she ripped another one, which became a bracelet – now it is just this. I’ve had it for about two years and it has already had many lives. Mild Manners gallery is hosting ‘Burns at the Land’s Brim’ off-site in Special Group Studios (270 Devonshire St, Surry Hills). The show will open on Thursday March 24th from 11am-1pm.